In 2002, I got a crash course in Star Trek: The Next Generation. Prior to that year, I’d never watched an episode of the series, but I took in all 170+ programs in the space of about nine months. 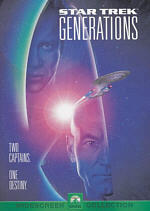 Although I’d not previously seen that TV series, I didn’t enter my time with Next Generation as a total neophyte. I’d already taken in the three theatrical films that used the cast and characters from Next Generation, so I felt moderately well acquainted with its world. This meant that I’d definitely broaden my horizons as I watched its seven seasons, but I didn’t start from zero. Such pre-knowledge didn’t exist when I started with the first season of Deep Space Nine. The third series in the Star Trek line, DS9 debuted in 1993 and actually ran concurrent with Next Generation for a while. I never saw an episode of DS9, and I knew almost nothing about its characters. I was aware of some DS9 actors and character names as well as the basic set-up for the series, and I knew Enterprise transporter chief Miles O’Brien (Colm Meaney) would move to the space station from the Enterprise. Otherwise, I saw DS9 Dr. Julian Bashir (Siddig El Fadil) do a guest spot on Next Generation, but I remained almost totally ignorant of the rest. That quickly changed when I delved into the six-DVD set that included all of Season One’s 19 episodes. These shows will be discussed in the order broadcast, which is also the way in which they appear on the DVDs. 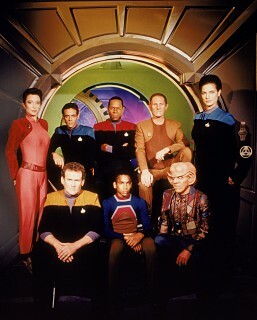 As with Next Generation, Deep Space Nine started with a double-length episode. Emissary sets up the series and sends its characters on an introductory adventure. 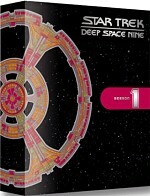 Deep Space Nine exists as a space station in orbit around the world of Bajor. Consistently pestered by the Cardassians, the latter recently split, and the Federation sets up a presence to counter their potential menace. Commander Benjamin Sisko (Avery Brooks) receives the assignment as its new chief. We first meet him during a sequence that took place three years prior to his arrival. We see his time on the Saratoga and its part in the attack on the Borg cube that included the transformed Captain Picard (Patrick Stewart). Sisko’s wife Jennifer (Felicia Bell) died in the attack, but Sisko managed to retrieve his son Jake (Cirroc Lofton) before the ship exploded. Jake comes with Sisko to live at the damaged space station. It seems that the Cardassians attacked it before they left, so it doesn’t remain in good shape and it includes only a bare allotment of supplies and amenities. Slowly we meet its new crew. We start with newly promoted Chief of Operations O’Brien and also get to know Major Kira (Nana Visitor), a Bajoran officer who will act as Sisko’s first officer. Shape-shifter Odo (Rene Auberjonois) acts as security chief, and when the nephew of Ferengi Quark (Armin Shimerman) commits a crime, Sisko puts Quark in charge of the shops and entertainment of DS9’s Promenade as payback. Since the Bajoran government remains unstable, Picard tells Sisko he needs to prep them for potential entry into the Federation. Sisko meets Kai Opaka (Camille Saviola), the spiritual leader of the Bajorans, and he attempts to get her to influence the people to accept the provisional government. She tells Sisko he needs to accomplish a spiritual mission before she can address politics. We then meet a couple more crewmembers: Lt. Jadzia Dax (Terry Farrell) and Dr. Julian Bashir. The former is a Trill, a joined species; this means a little worm lives inside her, and it changes bodies when its host dies. Because of that, Sisko doesn’t recognize Dax, as she was an old man the last time he saw her. Young and green Bashir doesn’t know this, and he clearly has the hots for the station’s science officer. While they investigate the Bajoran orbs, they discover what appears to be the first known stable wormhole. Sisko gets drawn into this and meets a species that controls the orbs. They challenge him to educate them about linear species, as they know nothing of time differences. Essentially they put humanity and other linear folks on trial and he has to validate them to gain the acceptance of the wormhole folks. If you watched Season One of Next Generation, that theme might seem familiar. Back in that series’ first episode, Q (John de Lancie) put humanity on trial for various crimes, and “Emissary” bore more than a few similarities with the 1987 program. Still, despite some self-plagiarism, “Emissary” launched Deep Space Nine reasonably well. At times, it tried a little too hard to be a Big Start for the new series, but it managed to convey a lot of information in a short period. Next Generation only needed to introduce its characters, as it worked on the same exploratory framework as the original series. DS9 needed to bring in many new personalities and also set up its situations and locations. The space station setting made DS9 different from its predecessors, and that concept required some attention. Add to that the notion of the wormhole – one that would become very important to the series – and “Emissary” acted as a reasonably decent introduction to the show. Nothing about it seems terribly intriguing, but it succeeded as a start. Even the obligatory cameo from a Next Generation character – Picard, in this case – seemed well-handled, as opposed to the cheesy McCoy guest shot in Next Generation’s “Encounter at Farpoint”. Kira’s history confronts her during Past Prologue. In Bajoran space, a Cardassian ship pursues a Bajoran craft and DS9 takes on its sole inhabitant before it gets destroyed. We meet Tahna Los (Jeffrey Nordling), a member of the Bajoran terrorist group Kohn-Ma who knew Kira from her old days as part of the underground resistance. He desires political asylum, which Sisko grants despite some suspicions. Sisko’s doubts come true when we find that Tahna’s in league with the Klingons and he may not have renounced his terrorist ways after all. “Prologue” helps develop the series’ Bajoran elements but seems a little weak in the end. Essentially the show packs too many different elements to fit snugly in its running time. It’s intriguing to see Kira have to confront her loyalties, but “Prologue” waters down that theme when it makes Tahna an obvious baddie. It also unnecessarily complicates matters with unneeded characters. “Prologue” still seems decent, but it becomes too muddled. Note that “Prologue” offers DS9’s first glimpse of the Klingons. Actually, it provides some well-known Klingons. We see the Duras sisters, Lursa (Barbara March) and B’Etor (Gwynyth Walsh), both of whom will be very familiar to Next Generation fans. Two themes mix in A Man Alone. Much of the episode shows the growing pains of the DS9 inhabitants as they get accustomed to the station. Foremost among these are the frustrations of O’Brien’s wife Keiko (Rosalind Chao), who feels useless since she can’t easily engage in her career as a botanist. In the meantime, Odo gets upset at the presence of a Bajoran named Ibudan (Stephen James Carver), a black marketeer who our local shape-shifter once imprisoned. Someone kills Ibudan during a holodeck massage, and Odo becomes the prime suspect due to his obvious animosity toward the sleazy Bajoran. The head of security leads the investigation into a crime he seems likely to have committed? That’s a fairly cheesy concept, but “Alone” pulls it off acceptably well. The show helps define personalities a little better, even if it lacks much suspense. Its placement as such an early episode makes it somewhat more intriguing since none of the DS9 personnel know each other really well. Had the program occurred a few seasons later, it might seem more cut and dried, but because the characters remained unknown entities to each other – and us – at the time, suspicions become enhanced. That element helped make “Alone” a fairly interesting show, though it suffered from an unsatisfying ending. At the start of Babel, we see all the pressure everyone puts on Chief O’Brien. The replicators malfunction, but after they start to work again, we see O’Brien start to speak and write in nonsense. This spreads to Dax and others and quickly threatens the entire population of DS9. While “Babel” enjoys some interesting moments, it doesn’t go much of anywhere, at least not in its first segment. It leaves the viewer much too far ahead of the crew. However, it picks up somewhat during the second half, as we start to learn more about the cause of the illness. “Babel” remains lackluster overall, and it includes too many melodramatic moments to become anything more than average at best. DS9 makes first contact with a new species in Captive Pursuit. A lone ship emerges from the wormhole and reluctantly agrees to dock for repairs. On board we find Tosk (Scott MacDonald), a reptilian dude who has never met humans. O’Brien buddies up to him and educates him about the station and other topics, but he doesn’t learn much about the alien other than “I am Tosk”. O’Brien and Sisko feel suspicious of Tosk, however, and their concerns seem sensible when we see the alien alone; he immediately goes on the computer to find out the location of the station’s weapons and ends up in a restricted area. In Q-Less, we find crossovers from some of Next Generation’s most memorable characters. A ship piloted by Dax makes an emergency return to the station, and it comes with a passenger known to Next Generation fans: Vash (Jennifer Hetrick), the morally-ambiguous archeologist who once had a fling with Captain Picard. Sisko and crew feel suspicious of her, though horny Dr. Bashir clearly wants to cozy up to her. She claims to have spent two years in the Gamma Quadrant, but no one believes she could make it alone in such a hostile territory. We soon learn that Vash has a partner: our old pal Q. He’s worn out his welcome with her, though, and she wants him gone. The pair have their fights, and O’Brien puts the staff on alert when he recognizes Q. In the meantime, O’Brien tries to figure out what went wrong with the ship but he sees nothing about it that should cause issues other than something quickly sapped its power. Similar problems start to affect DS9. Matters go from bad to worse when the power drains so badly that the station starts to drift through the wormhole. Crossovers are a tricky thing, and it seems especially questionable to pile on two previously unconnected Next Generation characters. Had “Q-Less” boasted a strong plot, this pairing might have worked, but as it stands, it feels like a gimmick. Next Generation Q episodes worked largely due to the interaction between that being and Picard, but no such sparks fly here. Add to that another show in which the cause of the problem seems obvious to the viewer long before the crew gets it and “Q-Less” largely falls flat. We learn more about the station’s science officer in Dax. At the start, some aliens abduct Dax, but Sisko slams the tractor beam on them before they get too far. We meet Ilon Tandro (Gregory Itzin), the son of a general from Klaestron IV who was allegedly murdered by Jadzia’s predecessor, Curzon. Though the Federation has an extradition treaty with Klaestron IV, the Bajorans do not, and because DS9 technically falls under their domain, this means they must hold a hearing to determine if Tandro can take Jadzia with him. Much of the show follows this hearing, as we see Sisko’s attempts to defend his old friend even though she doesn’t seem to care what occurs. I wouldn’t call “Dax” a great episode, but I like the exposition about Trill society and its philosophical debate over responsibility. So far DS9 has seemed less thoughtful than Next Generation, and sometimes it comes across as a bit brain dead, so it’s good to get something a bit more introspective and provocative. Unfortunately, the episode suffers from a solution that appears much too neat and easy, but most of “Dax” offers a reasonably compelling piece. In The Passenger, Bashir and Kira intercept a plea for help from a dying craft. Its inhabitants warn the pair not to assist a prisoner who started the calamity. Bashir goes to this being’s aid, but Vantika (James Harper) dies anyway. Or does he? The sole survivor Kajada (Caitlin Brown) insists on seeing the corpse since Vantika faked his own death many times. Even though Vantika seems deader than dead, Kajada remains suspicious, especially since a shipment of deuridium – a substance Vantika needs to survive – will soon reach DS9. The plot thickens as issues occur on the station, and Odo also has to deal with jurisdictional challenges from the Starfleet security officer Lt. Primmin (James Lashly). Like many other DS9 episodes to date, “Passenger” telegraphs too many of its points in advance, but it still manifests a reasonably entertaining program. It creates a decent little mystery and contains a number of nice twists. Some hammy acting from Siddig mars the presentation, but it remains moderately good overall. After the Vulcans make first contact with a new species called the Wadi, those humanoids visit DS9 in Move Along Home. Led by Falow (Joel Brooks), the Wadi want nothing other than to visit Quark’s and gamble. When they clean up at Dabo, Quark cheats to stop them. The Wadi discover his shenanigans and want to punish him. They introduce him to their own game called “Chula”. Oddly, this contest somehow involves some of the DS9 crew as the playing pieces; when Sisko, Kira, Dax and Bashir awake, they find themselves stuck in the world of the gameboard. This leaves their fate somewhat in the hands of Quark, who plays the game. Over the years, many Trek episodes featured crew who got stuck in challenges such as these at the mercy of manipulative aliens. “Home” doesn’t bring much new to the table, though at least it gives us a unique forum. The integration of the game board into the fate of Sisko et al. makes the show more intriguing. Chalk up “Home” as a pretty interesting program. For an expansion of our knowledge of Ferengi culture, we move to The Nagus. Grand Nagus Zek (Wallace Shawn) comes to visit Quark, and he wants to hold an important conference at Quark’s establishment. Though Quark fears that Zek wants to take over his bar, instead the latter names the former as the new Grand Nexus. As appealing as this sounds, Quark soon learns that it’s not always good to be king. In the meantime, we see the problems Jake experiences in his friendship with Ferengi child Nog (Aron Eisenberg), who Sisko regards as a bad influence on his son. Trek often treats the Ferengi as comic relief, and “Nagus” doesn’t vary tremendously from that tone. However, it offers a nice look into Ferengi culture. I can’t say we find much depth to the species – they’re totally obsessed with commerce and profit – but it’s fun to examine the breed. I especially like the amusingly sick funeral custom described here. The parts with Jake seem sappy, but otherwise “Nagus” provides an entertaining show. Trivia bit: “Nagus” features one of the more subtle Godfather references I’ve seen. One scene clearly evokes the opening of that classic, but it doesn’t telegraph its connections. When Quark gets involved in the sale of a stolen bauble, Vortex starts with a slaying. Croden (Cliff DeYoung) wants the object and kills half of a pair of twinned Miradorn during a struggle. After the crew captures Croden, he tantalizes Odo with tales of other shape-shifters, a prospect that seems intriguing since Odo knows of no other members of his species. However, because Croden seems less than honest, Odo doesn’t know how much to believe. Since Croden belongs to the Rakhar, a culture with no prior known contact with the Federation, his situation turns more complex for Sisko, who then goes to contact that planet. Ah-Kel also seeks revenge for the murder of his twin. Boy, that’s a lot of competing subplots for one show! Too many, probably, though they do tie together fairly well. Still, the program lacks the coherence to become something special. It’d be interesting to get more involved in Odo’s psyche, but “Vortex” remains fairly superficial. At least it tries to venture into new territory, and it comes across as acceptably interesting. Kai Opaka from “The Emissary” returns in Battle Lines as she makes an unexpected visit to DS9. 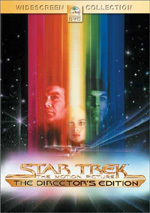 While on a trip to show her the wormhole, they intercept a subspace beacon that they pursue. An orbiting satellite attacks them, though, and they then crash land on a planet surface. The impact apparently kills the Opaka, and the inhabitants abduct the remaining crew of Sisko, Kira and Bashir. It turns out these folks can’t control the satellites, which keeps them stuck on the planet and involved in a ruthless war with another culture. Things seriously get weird when Opaka turns up alive, as do inhabitants seemingly killed in battle. One of the preachiest DS9 episodes to date, “Lines” nonetheless presents enough intriguing material to become compelling. The regenerative setting makes the show unusual and it helps make the show interesting. The presence of the Kai telegraphs the program’s ending, but “Lines” still comes across as a better than average first season episode of DS9. Three plots appear during The Storyteller. Sisko gets the assignment to mediate a border dispute between two societies: the Paqu and the Novot. Varis Sul (Gina Phillips) leads the former even though she’s just a teenager. Jake and Nog develops crushes on her and they get to know her while she tries to represent her people. In the meantime, O’Brien and Bashir go off on medical mission on Bajor. The people they meet worry about fate of the Sirah (Kay E. Kuter); if he dies, the whole village goes too because he defends them against a critter called the Dal’Rok. The Sirah passes during an attack but he names O’Brien as his successor, a prospect that doesn’t exactly excite the Chief. ”Storyteller” often feels more like an episode of Next Generation than most DS9 shows, a factor bolstered by the heavier-than-normal presence of Jake. I don’t think he’ll quite turn into the Wesley Crusher of DS9, but the show’s not done much positive with him to date, and the storyline with Varis and the kids seems hokey. On the other hand, O’Brien’s plot comes across as more entertaining. It mixes humor with mystery and seems like a decent piece. The forced relocation of people creates the main plot for Progress. The Bajor need to tap a moon for energy, but three residents remain there. Led by Mullibok (Brian Keith), they refuse to depart despite Kira’s pleas. Eventually, personnel come to remove them forcibly, and Mullibok gets shot in a struggle. The staff take away his compatriots but Kira insists that Mullibok stay behind, and she tends his injuries. In the meantime, Nog and Jake try to develop their skills as traders. Jake didn’t appear much during the series first handful of episodes, but these last few have tried to make up for that. Too bad those plots don’t go anywhere and they’ve just made me start to dislike the character. The main story works fairly well, however. Despite Nana Visitor’s consistent overacting, at least this show helps develop her character a bit as she debates whether to follow her duty or her heart. In addition, it’s fun to see an old star like Brian Keith, and he lends spark and depth to Mullibok. The show also boasts a nicely ambiguous ending that contrasts with many of the other programs’ more telegraphed points. Imagination runs amok in If Wishes Were Horses. After O’Brien tells the fairy tale of Rumpelstilskin to his daughter Molly (Hana Hatae), the gnome (Michael John Anderson) appears in person. After this, other figures from fantasies or holodecks start to appear in real life. Sisko and company need to figure out how to deal with this oddity as well as the external disaster that seems to threaten the station. ”Horses” feels more like classic Trek than most other DS9 episodes to date, and I mean that as a compliment. The show keeps the viewer guessing much of the time and it requires ingenuity to solve the problem. That makes it a fairly fun and interesting program.